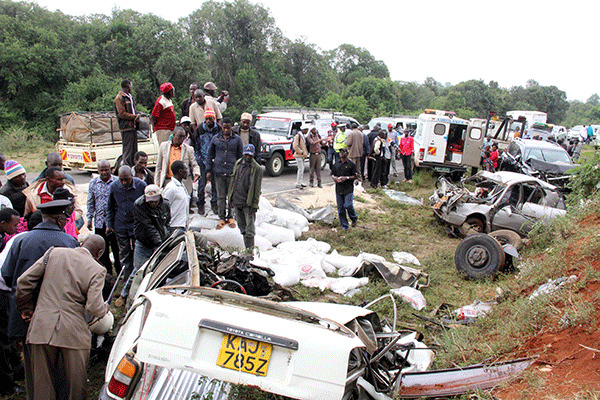 Four people have been killed in a grisly crash involving four vehicles at Embassy, near Dedan Kimathi University. The collision involving three personal cars and a lorry occurred a few minutes past 3pm on the Nyeri-Nyahururu highway. The four died on the spot while three others were injured. The smash-up is said to have been caused by the lorry driver, who was said to have lost control while trying to overtake. The driver of the lorry was arrested at the scene. Police said he was drunk at the time of the accident. According to witnesses at the scene, the lorry that was transporting animal feeds was heading towards Nyeri town. The driver attempted to overtake another lorry but lost control of the truck and rammed three on-coming vehicles, two saloon cars and a sport utility vehicle. The first vehicle to be hit, a Toyota station wagon, was carrying two people, a man and a woman. Both died on the spot. A man who, according to witnesses, was heading home from a medical clinic after he was injured in a previous accident was among the casualties in the second vehicle, a taxi. His wife, who had accompanied him to hospital in Nyeri town, was seriously injured in the crash. The driver of the taxi died as other motorists and police attempted to rescue him from the mangled wreckage. Occupants of the third vehicle escaped with minor injuries. Nyeri Central divisional police commander Muinde Kioko confirmed that the driver of the lorry, who escaped unhurt, had been locked up. “We have arrested the driver and we are still gathering facts on what transpired. But the driver appeared intoxicated at the time of the arrest,” he said. He is likely to be charged with causing death through reckless driving. The bodies of the deceased were taken to the Nyeri County Referral Hospital mortuary while the wreckages were towed to Nyeri Central Police Station. A report by a global agency has warned the fight against HIV/Aids in Kenya could be undermined by adolescents discontinuing treatment. The 2017 report by United Nations Programme on HIV/Aids (Unaids) has flagged Kenya's population of school-going teenagers as the most likely to stop treatment. Some, according to the report that gave a global update on HIV/Aids as per the 2016 numbers, may also never start medication even after being diagnosed and found positive. A report by a global agency has warned the fight against HIV/Aids in Kenya could be undermined by adolescents discontinuing treatment. The 2017 report by United Nations Programme on HIV/Aids (Unaids) has flagged Kenya's population of school-going teenagers as the most likely to stop treatment. Some, according to the report that gave a global update on HIV/Aids as per the 2016 numbers, may also never start medication even after being diagnosed and found positive. The flagged population are teenagers between the ages of 15 and 19, a majority of who are high school students, according to the report titled Ending Aids Progress Towards the 90-90-90 Targets. The report documented that treatment adherence among young people is generally lower: "...and treatment failure rates are comparatively higher, especially among adolescents who are transitioning from paediatric to adult care." The findings were derived from data collected in Kenya, Tanzania and Uganda. ALSO READ: World Health Organisation warns on faulty HIV test kit "Studies indicate young people aged 15–19 years are more likely to drop out of HIV care, both before and after starting antiretroviral (ARV) therapy," the report reads in part. And according to the studies, some of the reasons put forward for this scenario are stigma, discrimination and disclosure issues. Others are travel and waiting times at clinics as documented for those aged between 19 and 21. "Stigma and discrimination at healthcare facilities discourage people from using services that can protect their health and well-being, including HIV testing and treatment," the report added. Although results among young people (aged 15–24 years) did not quite reach the 90–90–90 targets according to the report (90 per cent diagnosed, 90 per cent treatment and 90 per cent viral suppressed), Unaids notes that the health outcomes for the population living with HIV has remarkably improved. This means chances of onward transmission of the virus have sharply reduced. In Kenya, despite 30 per cent of new HIV infections being among the youth (an average of 97 cases every day), viral suppression rates stand at 63 per cent.